Remember the Rose Bowl: Champ Pickens' 1925 Book "Alabama"
Champ Pickens' 1925 Book "Alabama"
In 1925, the ever entrepreneurial Champ Pickens struck upon a brilliant idea to promote Alabama football and, in the process, inadvertently created a publishing phenomena. Following the conclusion of the 1924 season, Pickens created an eight-page photo pamphlet titled "Alabama" believed to be the first publication devoted to Crimson Tide football ever produced. 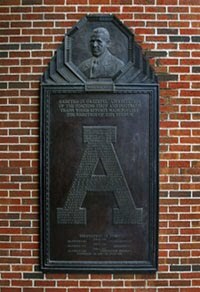 Pickens' book, which appeared sometime after the 1925 spring practices, proclaimed 1924 "the greatest in the history of athletics at the University of Alabama" and boasted of the golf squad's conference championship as well as the baseball and basketball team's second-place finishes. Yet the heart of the book was the series of photographs of the various football games played by the Alabama gridders. Under second-year head coach Wallace Wade, Alabama had rolled to an 8-1 record earned the Pickens' cup -- the trophy awarded to the champion of the Southern Conference donated by none other than Pickens himself. The Tide had completely dominated the schedule earning seven shutouts and outscoring opponents 290 to 24. The only defeat Alabama suffered during the 1924 season was a 17-0 drubbing at the hands of the Prayin' Colonels of Centre College -- an unlikely powerhouse that had humbled the vaunted Harvard squad in Cambridge, Massachusetts just three years prior. Pickens wrote that the varsity prospects for the 1925 season were "very bright" and "it is hoped the 'Crimson Tide' will roll to another championship." His words proved prescient. Not only did Alabama follow up with another Southern Conference Championship, the Tide claimed its first National Championship as well after defeating Washington in the 1926 Rose Bowl. To commemorate the achievements of the 1925 team, Pickens promptly produced a follow-up book "The Will To Win."